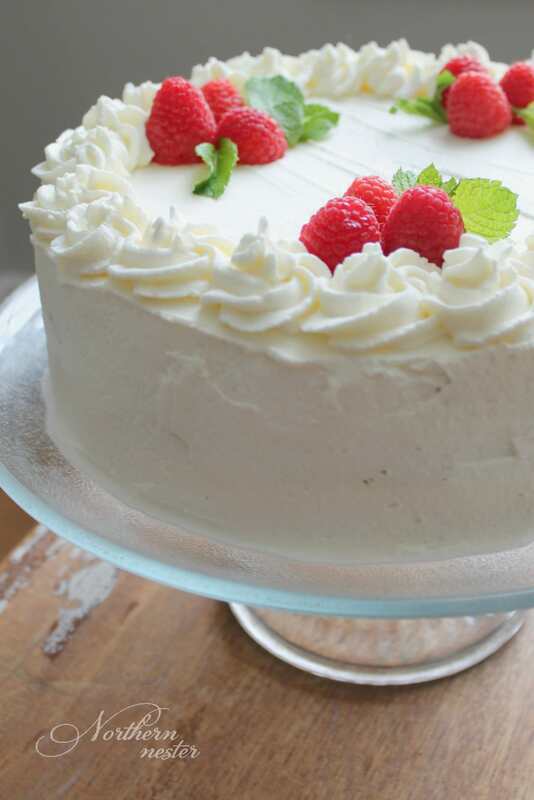 …so I made a Lemon Raspberry Mousse Cake to celebrate! I am continually amazed that I can eat foods this delicious and with negatively affecting my blood sugar. I hope to write more about the things I’ve learned over the last 5 years on THM in another post soon, but let’s just get straight to this Lemon Raspberry Mousse Cake, shall we?! For the cake layers, I simply doubled my Lemon Yogurt Cake recipe, baked it in two 9″ round baking pans, and cut each one in half horizontally. That lemon cake recipe is truly one of my favorite THM-friendly cakes, and it tickles me to see that you’ve all enjoyed it just as much! 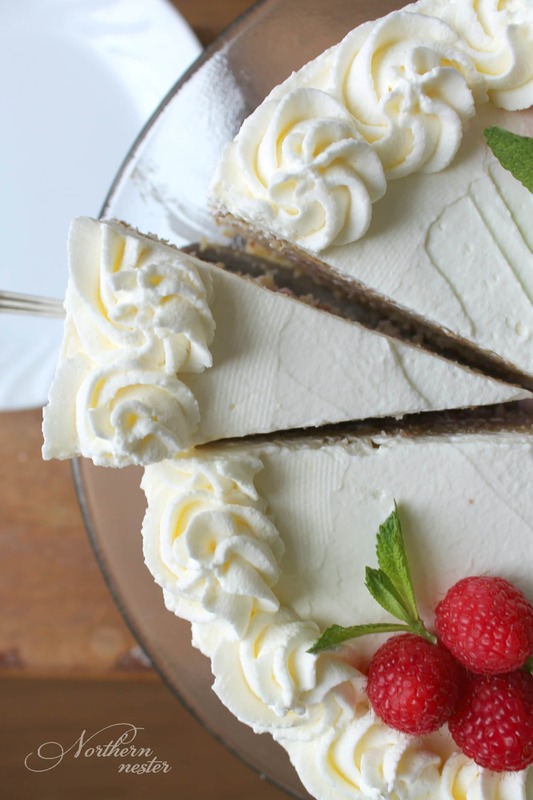 A simple white coat of naturally sweetened whipped cream encases the whole cake. A couple of well-placed raspberries (clusters of odd numbers are visually appealing in gardening, home decorating, and cake decorating!) with a few sprigs of mint are all that’s needed for an elegant garnish. 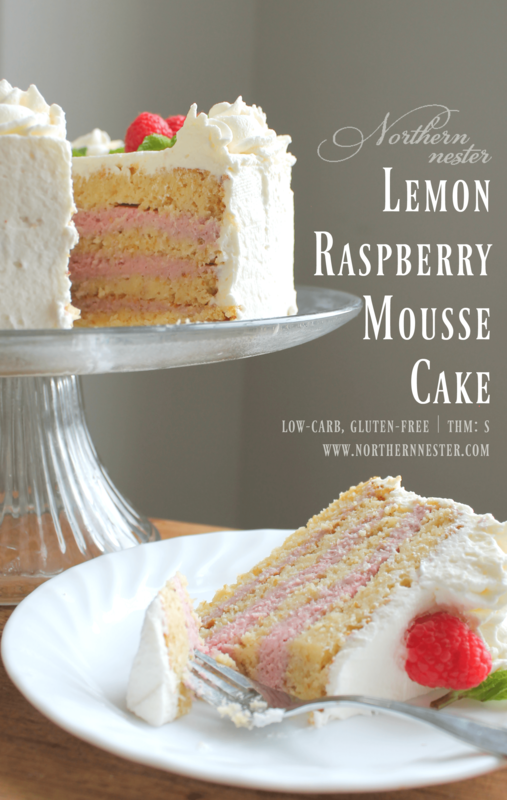 This Lemon Raspberry Mousse Cake is a little more involved because of the layers, but the cake and mousse recipes themselves are about as easy as it gets! No special ingredients or baking experience required to pull off this thing of beauty! Cake for breakfast and lose weight?! You would never believe that this stunning Lemon Raspberry Mousse Cake is sugar-free, low-carb, gluten-free and Trim Healthy Mama-friendly! Sometimes things that look and taste too good be true....aren't! Preheat oven to 350 F. Line two 9" round baking pans with parchment paper and grease the sides. In a large bowl or stand mixer, beat sweetener, yogurt, eggs, melted butter, lemon extract and optional lemon zest together for 2-3 minutes or until light and smooth. In a separate bowl, stir almond flour, coconut flour, golden flaxseed meal (OR use 2 cups of Trim Healthy Mama Baking Blend instead of these 3 ingredients), baking powder, and salt together. Add to wet ingredients and stir until well-combined. Pour into prepared pans. Bake in preheated oven for 30 minutes, or until toothpick comes out clean. Cool completely. 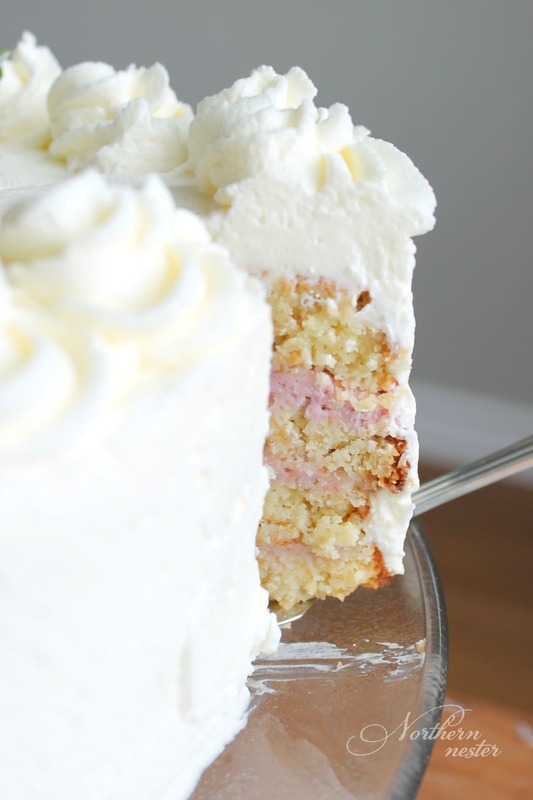 Slice each cake in half horizontally so you have 4 cake layers. To make the mousse filling, bring berries and sweetener to a boil in saucepan until they become liquid. In the mean time, soften gelatin in another dish by pouring 1/4 cup of water over top of the powder. Set aside. Remove berries from heat and press through a fine sieve or cheesecloth. Return to stove and stir in the softened gelatin until completely dissolved. Remove from heat and cool slightly. Beat in cream cheese. Beat whipping cream in a separate bowl and fold into berry mixture. Chill in fridge for an hour or 2 until thick enough to spread onto cake. To assemble the dessert, place first cake layer on a serving plate. Carefully spread on 1/3 the mousse. Repeat 2 more times, ending with 4th cake layer on top. Beat whipping cream and sweetener together until stiff. Pipe or spread onto sides of cake. Refrigerate until ready to serve. Garnish with fresh berries and mint before serving. I’m so glad you used the Lemon Yogurt Cake recipe for the cake part. We LOVE that cake! I would have made this today except I just now got done making your pumpkin chiffon pie! Hubby is coming home today after being out of town and it’s one of his favs. So, I thought I’d surprise him. 🙂 This cake will be on my NEXT-LIST! It’s so pretty! Just wondering about the whipped cream as ‘icing’, does that stay on there for a couple of days pretty good? Is there a dairy free alternative to this recipe? YUM! I wish I could understand the THM program. It seems so complicated to me. I have been doing low carb for about 8 months. I have lost nothing since Oct.I only want to lose about 5 more pounds. Can you substitute 2C THM Baking Blend for the flours? This looks amazing! But I want sugar! Can I substitute the xylitol with regular sugar? And could I substitute the 2 flours with all-purpose (or cake flour)? What does the flaxseed meal do? Something I could substitute for that? I would love to make this, but not looking for low-carb or sugar free. Thanks so much! With my experience baking with coconut flour there is no other flour to exchange with. It is a very dry flour and needs lots of eggs/liquid. I would just look for a regular recipe for the layers and use it. There might be one with similar taste to this one on the internet. Can monkfruit sweetener or stevia be used in place of xylitol? Any guesses on the conversion? I want to make this for my friend who’s following paleo. Do you know if this would work? Okay, maybe I’m over thinking this, but after straining the raspberries, do I use the pulp like a jam, or the juice like a jello? After straining the berries, there was nothing left but seeds in the strainer. That answered my question. The juice made a wonderful filling (though I really have a sweet tooth and needed more sweetness added). Can’t wait to cut into it! Made the cake with the THM baking blend and gentle sweet. I also added the lemon juice from one lemon along with its zest. I wish I would have listened to my self when I felt like 1/2 cup butter was way too much- and after making the cake I decided that 1/4 cup butter would have been much better. It was so greasy and then with the whipped cream it just felt and tasted laden with fat. I also reserved some of the gelatin to stabilize the whipped cream frosting so it wouldn’t weep after a few days. So over all it was good but next time I will make it with much less butter. It is my husband an my 19th wedding anniversary tomorrow and my 16 year old daughter is going to make this for us using black raspberries growing in our backyard and mint from my garden. I am really excited to try it for my ketogenic diet and our special day. I have been eying the cake for a few months now. Thanks!